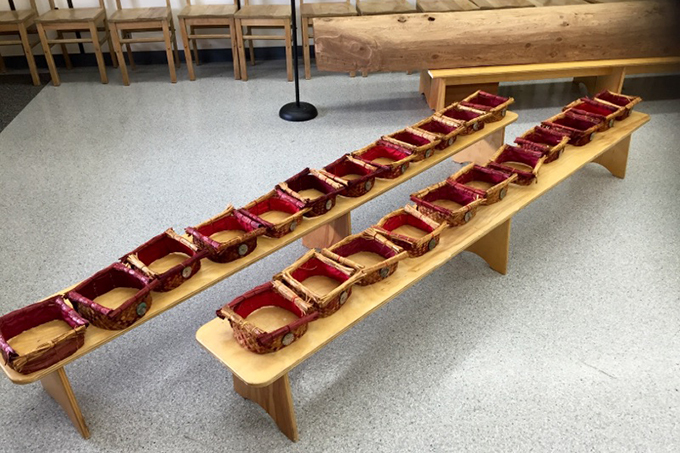 Today's guest blog was written by teachers at Alert Bay Elementary in Alert Bay, BC. Earlier this year, Grade 5-8 students took part in a large-scale creative project with artist Donna Cranmer, supported by an Artists in the Classroom grant. The project blossomed to include community and culture. Read on to learn more about it—and how YOU can bring the arts into the lives of young people. 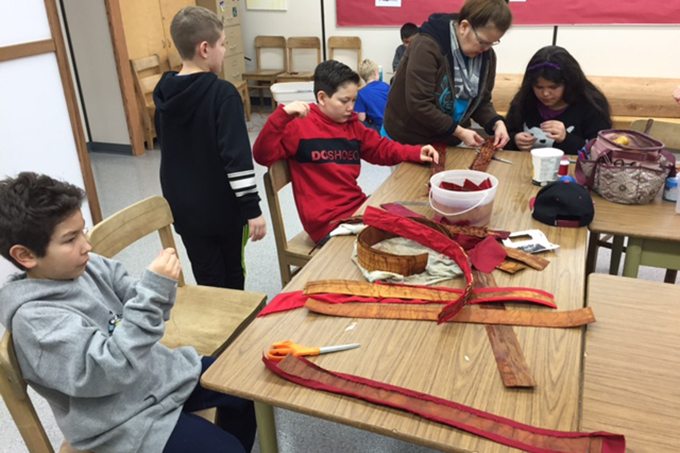 In January 2016, the Grade 5/6/7 class at Alert Bay Elementary began working with master weaver Donna Cranmer to create cedar bark headpieces. Donna Cranmer is from the 'Namgis First Nation and has been visiting classrooms and different communities sharing her cedar bark knowledge. 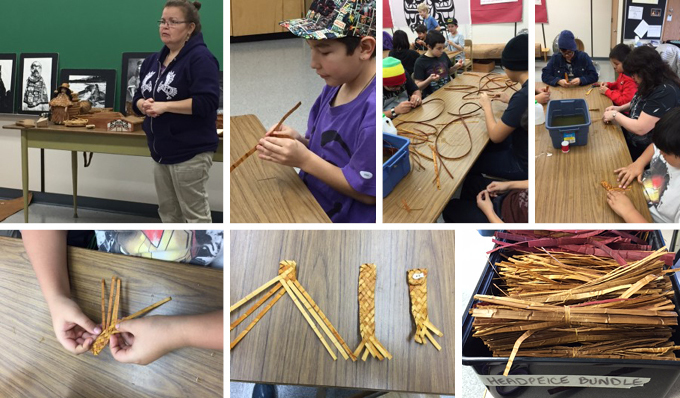 Over the last six months, the students have not only learned about cedar bark from Donna but also how to weave, harvest, cut, thin and dye cedar. Master weaver Donna Cranmer is shown here on her first day with the students. Her Kwak'wala name is Nalaga, which means Daylight Woman. She shared with us her knowledge of cedar and gave a little history about how she learned the traditional teachings of weaving. In the beginning of the project, the students started the process of thinning the bark used in weaving. They then practiced the beginning stages of weaving, creating cedar bark bookmarks and finishing them off by sewing a small abalone button on the top. When the students could confidently weave longer bookmarks, Donna believed they were ready to begin the headpieces. 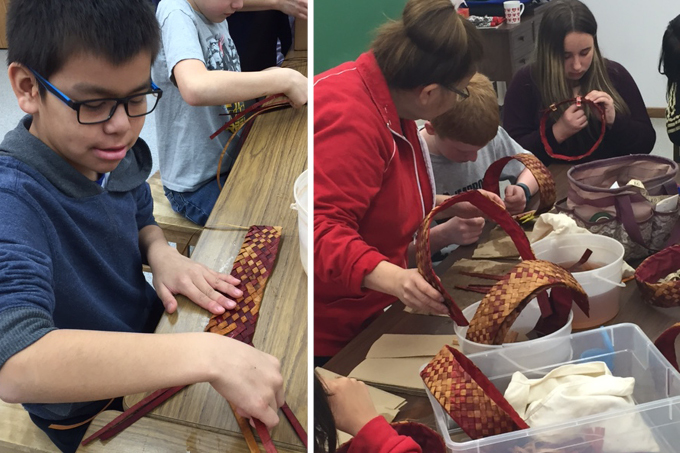 The students began weaving larger bands using cedar that was in its natural state, and cedar that had been dyed red. Once students had completed some of the woven headbands, Donna introduced a new element of sewing the fabric backings on the headpieces. Students were discovering which part of the process that they really loved. While all of this was happening, a small group of students took some of the thinned cedar strips, and started making the bundles for the sides of the headpieces. Donna explained to the students that this was important to have a good sized bundle otherwise the headpiece does not look right. The headpieces were constructed using diagonal plaiting. Students created a bundle and back piece, covered the inside of the band with material and sewed all the pieces together with an abalone button sewn onto the front. 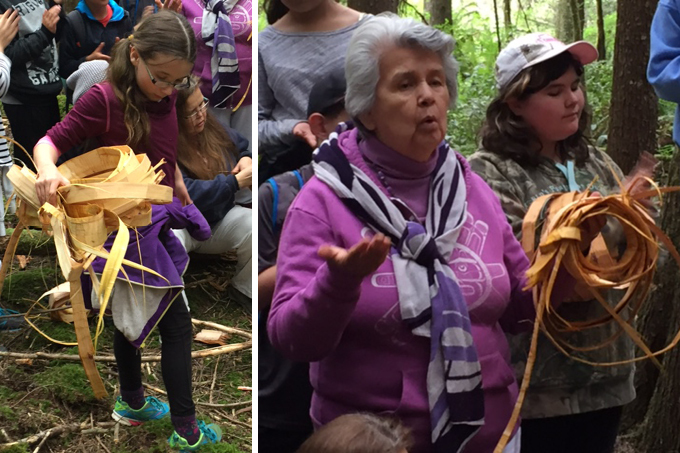 On Tuesday, May 17, our students travelled to the forested area by the Nimpkish River to gather cedar bark with Donna, community members Anthony Hunt, Andrea Cranmer, and Elder Ada Vera Cranmer. The students learned many traditional skills and teachings such as how to pull bark from the tree, how to take the outer bark off, how to roll it up and tie it for travel and how it needs to be dried and stored for future weaving use. This has been a meaningful learning experience, and we are very grateful to Donna, Anthony, Andrea and Ada for sharing this day and teachings with us. 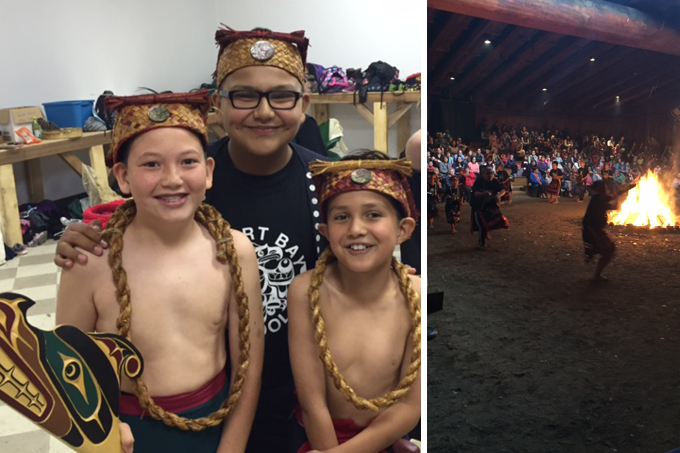 The finished headpieces were worn at this year's Cultural Celebration on June 3, 2016 at the Big House in Alert Bay. These headpieces have now become a part of Alert Bay Elementary's regalia to be used by students for years to come. This project was being made possible in part by an Artists in the Classroom grant disbursed by ArtStarts and contributions from our Alert Bay School PAC and Hakai Land and Sea Fishing Resort. The students, staff and school community thank all of these generous supporters from the bottom of our hearts for making this rich learning opportunity happen at our school. 1. 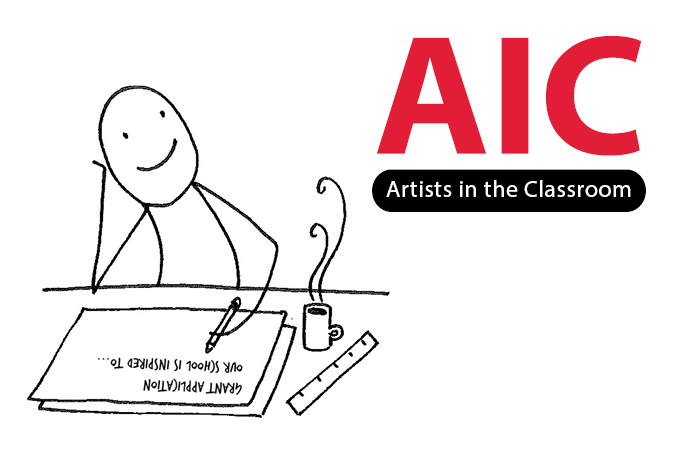 Teachers and Artists — Apply for Artists in the Classroom Grants! 2. 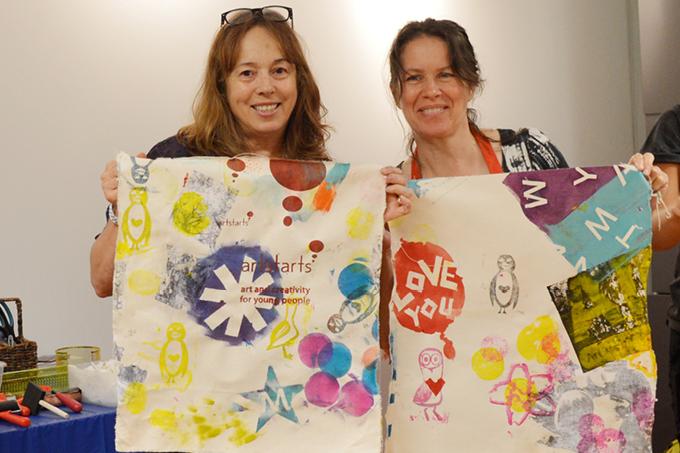 Teachers — Register for the Upcoming Pro-D Day at ArtStarts! Stand Out! 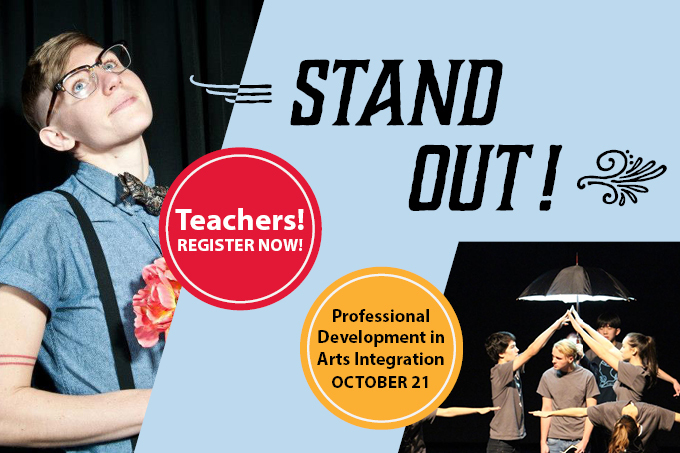 Putting Learning on the Centre Stage through the Performing Arts is a full-day professional learning experience for BC teachers on Friday, October 21, 2016 at the ArtStarts Gallery in Vancouver. This event will engage your creativity while exploring arts integration as an approach to teaching. Take part in two hands-on, skills-based workshops in the arts that aim to nurture your creative confidence: Page and Stage with spoken word poet Dia Davina and Physical Theatre in the Classroom with theatre artist Susan Bertoia. The workshops will be followed by a plenary conversation, facilitated by educator Leanne Ewen, on how we can immediately put these newly learned art skills into action in the classroom. The Arts in Education Council of BC Fund offers grants to support teachers' professional development in the arts. Grants of up to $500 can be used to assist in the presentation or attendance of professional development workshops, clinics or seminars designed to increase the appreciation of the arts for K-12 teachers in BC schools.